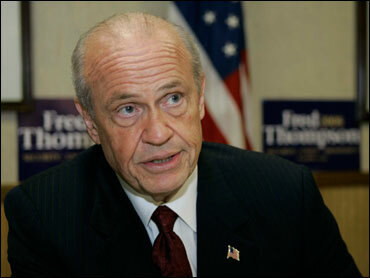 Republican Fred Thompson played down a staff member's departure and a New Hampshire supporter's defection Wednesday, saying it's not up to him to know what's going on at every level of his presidential campaign. "This is a campaign with a lot of different moving parts and a lot of things going on simultaneously," Thompson said in an interview with The Associated Press. Thompson's campaign recently lost Nelson Warfield, a political media strategist, and New Hampshire Republican Dan Hughes said he had switched to John McCain's team. "You know, the campaign can address that. I can't really address who's doing - and who was doing - exactly what at every level of this campaign," Thompson said after speaking to about 300 people at a restaurant in South Carolina. "They're the ones who know what's going on a daily basis. ... I'll let the experts speak on that." Thompson said fundraising and polls show that his campaign is meeting expectations. The former Tennessee senator said he was paying plenty of attention to early-voting states, though he hasn't been seen in New Hampshire since he formally entered the race in September. This was just his second campaign visit to early-voting South Carolina. "I've got a focus on all of the early primary states and at the end of the day, I will have been in all of them many times," Thompson said, noting he wrapped up a six-city spin through Florida on Tuesday. "You can't do all of them at the same time all the time." As Thompson weighed a presidential bid this summer, his campaign dealt with the departure of several high-level aides in staff shake-ups. He also struggled to meet expectations his backers set for raising money. By fall, he had brought on a new campaign manager and hired a set of senior aides who had experience in political campaigns, entering the race in September with a stable campaign. He also reported raising $12.5 million in four months with 80,000 donors. Aides say Warfield had been operating as a media consultant for a few months but left the campaign when Thompson hired a new media team. Hughes, a New Hampshire developer who helped Ronald Reagan's campaign in 1980 and later Reagan's White House transition team, publicly split from the Thompson campaign last week, suggesting a lack of interest by the candidate in New Hampshire. South Carolina, Florida and New Hampshire are among the states that Republican leaders have recommended be stripped of half their GOP National Convention delegates for holding primaries before Feb. 5. South Carolina's GOP leaders are considering legal action to keep its delegates. Thompson said he wasn't focused on which states might lose delegates. "It's hard to figure out, so I don't try to," Thompson said. "There's really not much a candidate can do about that. You hate to see anybody lose their delegates. I hope that they're able to work it out." He laced his half-hour speech as well as a question-and-answer session with a folksy spin on national and international issues, saying that Washington isn't the font of wisdom. "We don't need to invent new ideas," Thompson said, because proven ideas haven't been around for a long time. "I've got a plan for bringing our troops home from Iraq. Win the war and bring our troops home from Iraq. ... Keep taxes low and quit spending our grandchildren's and their grandchildren's money. On illegal immigration, enforce the border, secure the border and enforce the law." The simple talk on complex issues brought applause. Thompson also talked about a need for energy independence. "Russia's got oil now and of course they're feeling their oats because they've got the oil and they're reaching out and touching a lot of the countries around them now, you know, in strange and mysterious ways. And a lot of their people have become real accident prone lately who are dissidents over there," Thompson said. "All my new buddies running for president who have found the duties of conservatism, I say welcome to the club," Thompson said.